The stunning beauty of nature can be truly appreciated during springtime, when the world comes alive after the bitter months of winter. For many people, spring is characterised by a plethora of wonderful flowers which burst from the soil from March through to May. The same feeling of triumph that we experience as winter disappears behind us also seems to be felt by nature as it erupts in a technicolor expression of joy. A number of species of European flower, many of which bloom in spring, have been adopted as emblems and symbols by the countries of Europe. Cultural and religious practices that go back thousands of years are often behind the choice of flower. From the rolling hills of Western Island where the Shamrock grows thick in the meadows to the rugged coastline of Malta, where the Maltese Rock Centaury clings; the continent is rich with flowers. Whilst the flower season gets underway, let’s take a look below at some of the most popular national flowers of Europe and look into some of the stories behind them. 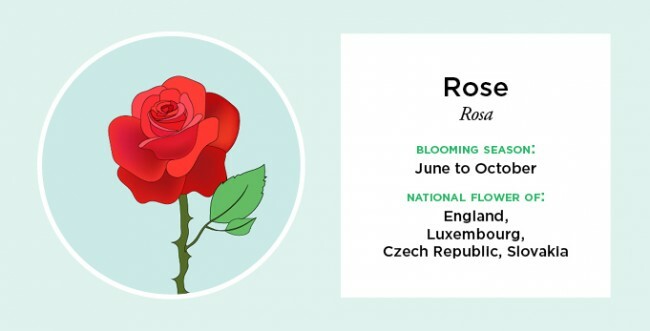 The elegant Rose is the national flower of not just England but also of Luxembourg, the Czech Republic and Slovakia. There are many reasons why these countries have adopted this fragrant beauty. Ever since the Wars of the Roses in the 15th century the English have adopted the Rose as their national emblem. Today it features frequently in English culture – you can find it on the England rugby team’s emblem and on the county of Yorkshire’s flag. It has long been a symbol of love and passion and it’s no surprise that such a flower is a popular country emblem. 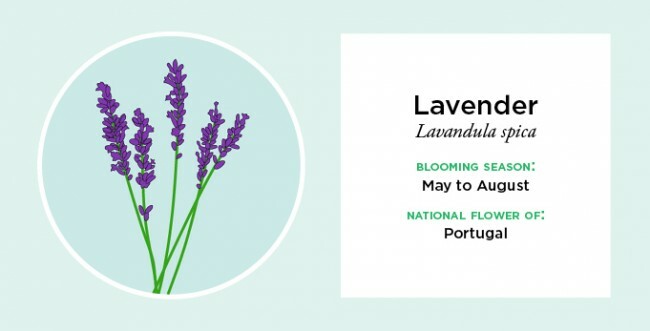 Lavender is Portugal’s national flower and is part of the extended mint family of plants. Lavender is a popular cooking ingredient and its potent oils can be found in many balms, salves and perfumes. Not many countries offer such a variety of scenery as Portugal does, and its flora and fauna are equally diverse. Visitors to the country between May and August are likely to encounter huge fields of lavender. The name derives from the Latin word ‘lavare’ which means ‘to wash’. Lavender is known for its soporific effects and many people sleep with a sprig of it in a bag under their pillow! A native to Eurasia which has been cultivated for more than 20 centuries, the Carnation is a particularly striking flower. 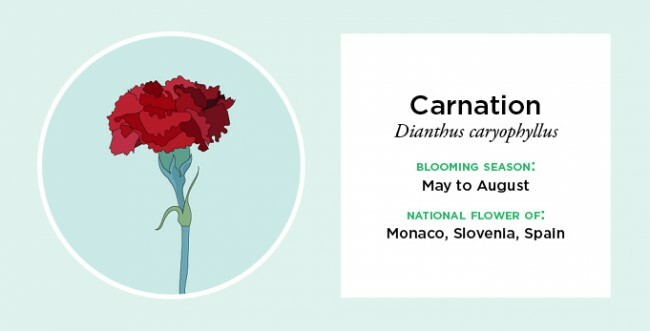 Often used as a floral decoration for men’s suits, the carnation gives off a sweet scent. The Red Carnation is Spain’s national flower, and it grows particularly enthusiastically in the region of Aragon. The carnation’s association with Spanish folklore is the reason why it is the country’s emblem. Symbolizing passion, a familiar image in Spanish culture is that of the carnation gripped passionately between the teeth of a potential suitor. Despite its sweet scent and easy-on-the-eye bell flowers, the Lily of the Valley is extremely poisonous. The flower has a practical use due to its fragrance and is frequently used in bridal arrangements and bouquets. 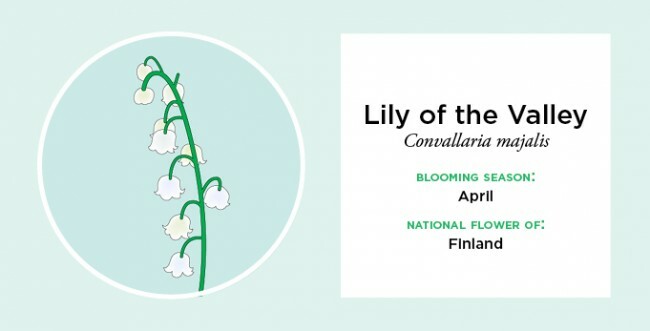 Since 1967 it has been the national flower of Finland, where it most comfortably grows. 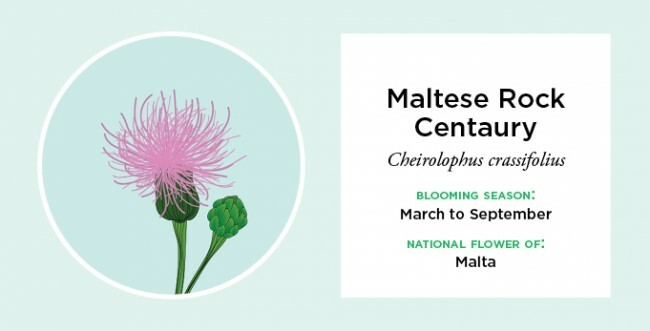 The aforementioned Maltese Rock Centaury can only be naturally found on Malta and has been the island’s national flower since 1971. It’s usually found along the rocky coastline towards the southwest. Considered to be in critical danger of becoming extinct, national legislation has been established to ensure its protection. Maltese people are very proud of the Rock Centaury, known locally as the Widnet il-Bahar, and it is revered for its healing properties. In the Netherlands, locals know that Spring has truly arrived when the Tulip fields suddenly burst into color. Since the 1950s, the country has been at the center of the world flower trade. 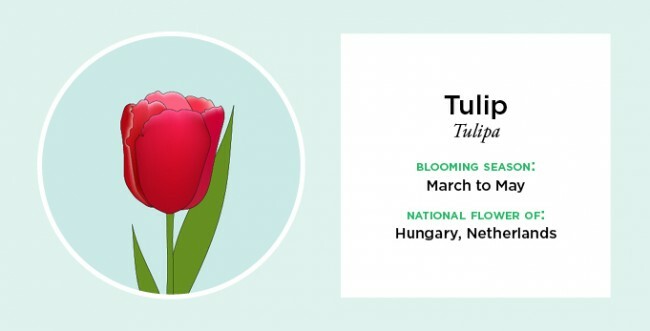 Originating from the Ottoman empire in the early 17th century, the elegant and charming tulip not only represents Dutch life but also prosperity and a place on the world stage. Did you know? Tulips require cold winters in order to grow and their bulbs are a good substitute for onions in cooking! 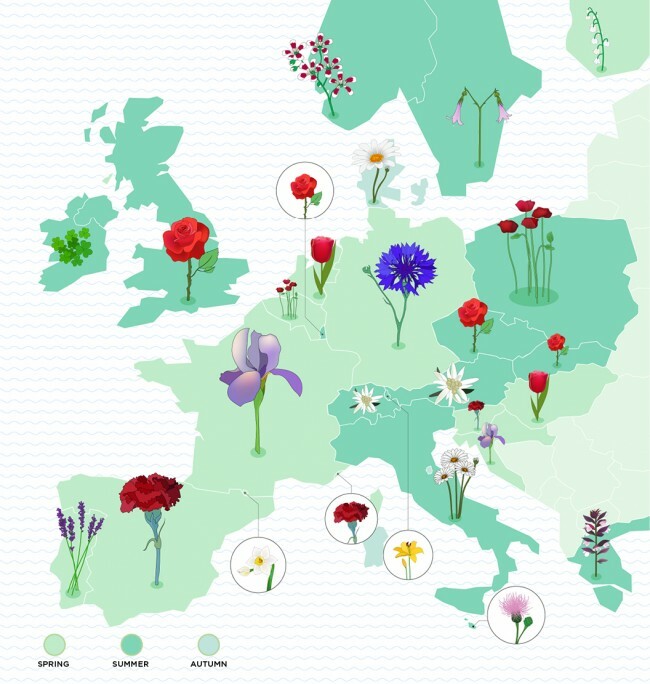 For a comprehensive list of Europe’s National Flowers, take a look at this post on LoveTheGarden.